Inspired by the hit Dragon Ball Super anime series, this battle engaging statue collection charges in at full power to give collectors the perfect image of their favorite heroic warriors. From the signature uniform to the battle hardened facial design, the incredible attention to mid-air action detail is the primary focus for this line of figures. 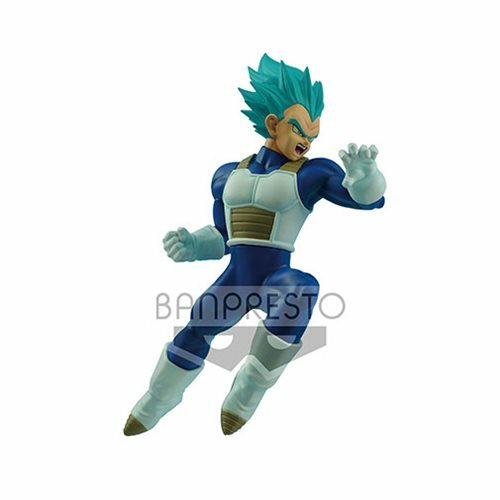 Fan favorite and super star fighter Vegeta charges into battle in his Super Saiyan Blue form. Not wasting any time, this Prince of Saiyans flies in to finish the fight. Standing at 6 1/3-inches tall, Vegeta comes with his own figure stand. Minor assembly required. Ages 15 and up.